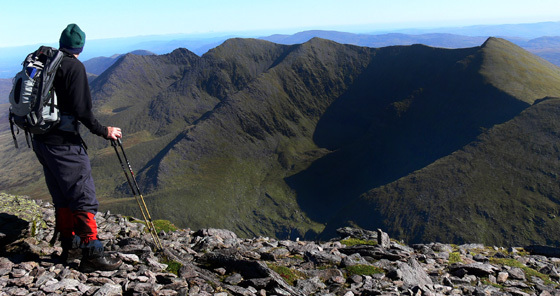 Picture from group : Looking across to the Eastern Reeks Ridge from Carrauntoohil summit. Picture: Looking across to the Eastern Reeks Ridge from Carrauntoohil summit. 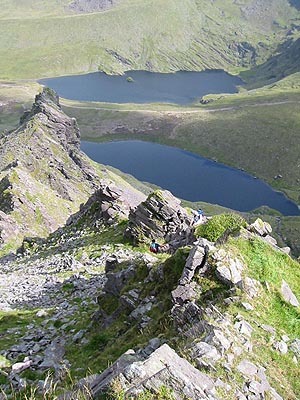 In the past the most used way up Carrauntoohil was by the Devil's Ladder. In recent years notices have been posted strongly advising that this route should be avoided both in the interests of safety (loose rock) and avoidance of further erosion. The Zig Zags. Park at V837 873 A Cronin's Yard (charge) and follow the track SW. After 900m cross a small stream and then, shortly after, the Gladdagh River. Continue on a relatively gentle walk up between L. Gouragh and L. Callee towards the rocky gash marking the Devil's Ladder. At V812 841 B take a ramp left up to the start of the Zig Zags V815 841 C. Follow the winding track up to the plateau V81400 83450 D. Turn right (W) to cross Cnoc na Toinne top and then down NW to the col at the top of the Devils Ladder V80700 83650 E. Go NW up the steep bare slope to V804 841 F and then NNW to the top. Ridge up to Beenkeragh starting behind the great pillar of the Hag's Tooth (guide books we had call it the Hag's Tooth ridge) is a superb scramble. Go up to it via the steep grassy gully up to the right of the Tooth's base. Arete is longer and somewhat more testing than Brandon's Faha ridge, though perhaps slighly less exposed, but still overall within the same band of difficulty (for scramblers familiar with the UK grades it's a moderate Grade 2). The upper section breaks into two distinct ridges - we took the left hand one. More sustained scrambling here, though again not difficult. Views across to Carrauntoohil and back down to the Hag's Tooth are absolutely stupendous. 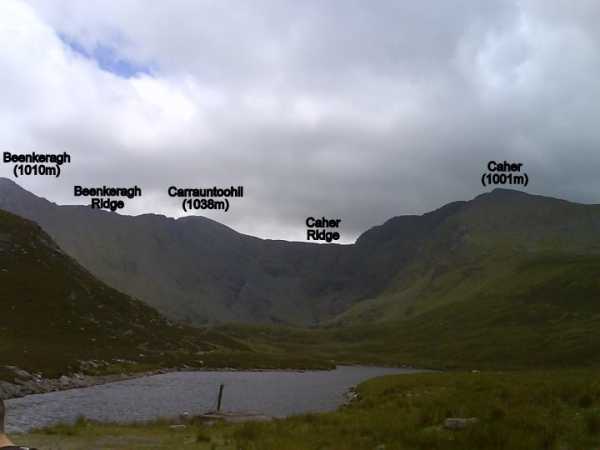 Beenkeragh ridge to Carrauntoohil is much easier, though exposed if you choose to skyline it, and has all difficulties avoidable by path on the right until the large pinnacle towards the end. To skyline it is not as hard as it looks, otherwise is avoidable at mid height on the left (Coomloughra) flank. Again, works out much easier than first appears. Simple walk up to the summit from there. Magnificent views. Unlike mountains in, say, the Lake District, the great Kerry peaks rise in relative isolation unhemmed by other groups and the views, with the sea so near, are incredibly extensive - you really feel as if you're on the roof of the world. Descent via the hugely eroded Devil's Ladder truly awful. Book suggested 'The Bone' as better alternative. Couldn't be worse. Got this email from a friend who does the IMRA race up and down Carrauntoohil. 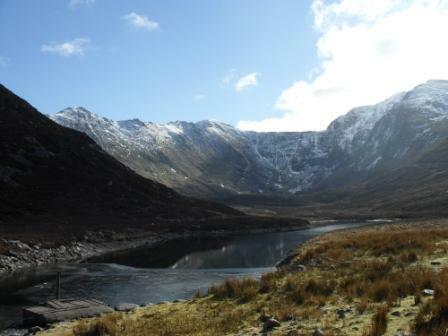 It goes up the Lack Road, across to Curraghmore, on to Caher and then to Carrauntoohil. Oh and then back down again of course! In 1988, the second year in the modern mountain running era that a race was run up the 1,039m peak, John Lenihan, a dairy farmer from the nearby hills , blew away the field and set a time of 71:43 for the round-trip to the cross atop and back, a time that has never been broken. Lenihan went on to win the race 14 times in a row and 19 times in all before retiring when the course was changed in 2010, only losing outright twice in that streak. Lenihan wasn’t a newcomer to racing that first year in Carrauntoohil. “My first taste of mountain running was on Peel mountain in the isle of Mann in 1983 when I won the isle of Mann Easter athletics race to the summit and back,” he recalls. “I repeated this victory in 1985 and then came back to Ireland to win the Sligo warriors mountain race.” He remembers that race as significant because of the 1,000-pound prize purse and because he beat the then reigning world mountain champ Kenny Stewart. Lenihan went on to win the world mountain championship himself when it was held in Switzerland in 1991.